The US dollar index ended the week virtually flat even though we saw a great deal of daily turbulence. The greenback posted a modest gain on the month of July with the benchmark index rising to 97.2. The uplift came mostly at the expense of the euro, yen and the Canadian dollar. Friday’s economic data was decidedly mixed and this caused some extreme moves in EUR/USD and GBP/USD and USD/JPY. An early hit came on the release of the latest wage data. US workers saw tepid wage growth in the second quarter according to figures released by the Bureau of Labor Statistics. The official employment cost index recorded a 0.2% rise in the second quarter, missing the forecasts of 0.6% by a wide margin. This data came as a surprise after employment costs underwent strong gains in the previous four quarters. The dollar sold off sharply as the frail rise in pay indicates there could be more spare capacity in the labor market than current estimates predict. The dollar saw strength return after some upbeat manufacturing data. The Chicago purchasing managers’ index – often watched as forward indicator for manufacturing health – was particularly strong this month at 54.7. The index was up 5.3 points. The markets were looking for a number of 50.5 so the data provided a positive surprise. The strong number also raised expectations that Monday’s broader surveys from ISM and Markit will also provide an upside surprise. The ISM manufacturing PMI is expected to be around the 53.6 mark. Friday’s number will have raised expectations for a strong reading. 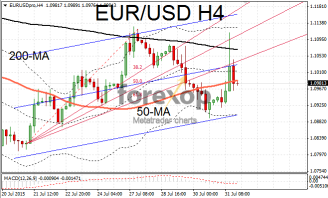 After rising 1.5% up to 1.1113 EUR/USD promptly sank again. 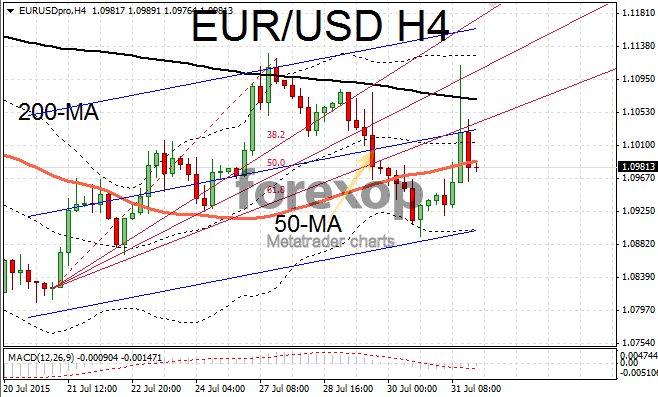 The release of the manufacturing data caused a rapid sell off and moved the market back to 1.0981. The level remains below the lower fib retracement line and under the 50-point moving average on the four-hour and daily charts. USD/JPY dropped as low as 123.56. The recovery took the pair back up to 123.91 but the level remained below the intraday high. A slew of market moving data is due this week with nonfarm payrolls on Friday. Friday’s employment data will be the dominant event for the week. Nonfarm payrolls are expected to have registered a small increase in July to 224,000. The unemployment rate is expected to hold steady at 5.3%.